Suzanne Fisher was the executive director of the California Association of School Psychologists from 1999-2013. Ms. Fisher brought a wealth of government knowledge to the position, having worked in the Wilson and Deukmejian administrations. She mentored many board members on the workings of state government and how to advocate on behalf of CASP. The CASP Alumni Club’s Suzanne Fisher Memorial Leadership Award is given to individuals or groups who have worked to make systemic changes in policies that govern the provision of education and mental health services at the state or local level. In addition, these individuals or groups have worked to support the CASP mission and its goals. Individual nominees or groups have so distinguished themselves by this service that clear evidence of improvement of education and services for children can be readily documented. Nominees can include individuals or groups outside the profession, as well as those affiliated with school psychology. Must have contributed in meaningful ways to advocating for education, children and youth at the state or local level. Please note: this donation is not tax-deductible. Utilize senior members’ wisdom and contacts to improve advocacy and expectations for school psychology. PAC Donation: Donations of $100 or more per year makes one a club member. Time donation: Donating time and expertise to spread the word about the need for school psychologists. With an annual donation of $100, Alumni Club members will receive Legislative Updates from CASP, occasional requests to write letters of support (or opposition) regarding potential legislative and regulatory actions, and to consider visits to their state representatives regarding education and school psychology issues. This is to assist with the revitalization of the CASP “For the Children” Political Action Committee. “What School Psychologists Do” is the theme of this section of the Alumni Club program. Members will be asked to visit two community college or university psychology classes each year to introduce the students to school psychology. When interest has been determined CASP will schedule the presentations, send materials to the club member and follow up on how well the presentation was received. The club member decides where and when to make the presentation. This program is designed to increase the visibility of school psychology as a profession, as noted in the California School Psychology Foundation Vision Statement. At the Spring Institutes and annual conventions, Alumni Club members will be invited to a private social event. The event will be determined by the Alumni Club leaders, with the location of the institute or convention in mind. New Alumni Club members will receive their membership pins at each of these events. Alumni Club members’ opinions will be solicited on major legislative issues that affect school psychologists. Every Alumni Club member will receive a custom Alumni Club lapel pin. A series of pins is being developed to denote the length of time in the Alumni Club. The Alumni Club will celebrate 66 years of CASP Conventions with a dinner at the historic Mission Inn, located two blocks from the Riverside Convention Center, where CASP Convention 2015 will be held. 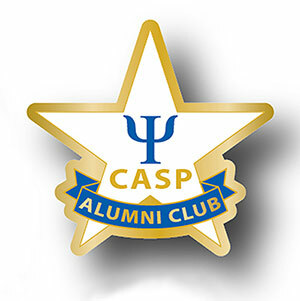 The dinner will be held Friday, October 16, starting at 6:00 p.m. New Alumni Club members will receive their lapel pins, we’ll discuss our legislative successes this year and get your opinions on what CASP should pursue in the coming years. More details to come. To learn more and to get involved as a founding CASP Alumni member, contact Lynne Aung or Heidi Holmblad.